This picture reminds me of Toby Tyler when the colonel lines Toby up with the girls, and says they look like two peas in a pod! This year the Ridgecrest Elementary Talent Show fell on March 28th. Olivia and her friend Kira decided they wanted to sing a duet, and Calvin wanted to get in on the action too with a recitation about the presidents on the dollar bills and magic trick. Olivia and Kira have been practicing for a couple weeks, and they were so excited for their performance. It was really cute. 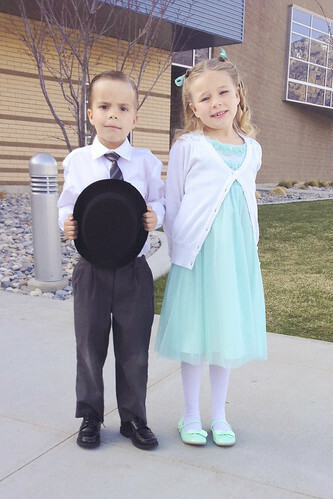 They both wore their Easter dresses, and sang their little hearts out. Calvin’s performance was CLASSIC! It cracked me up. He was such a good showman, and his talent was – seriously – the most unique one there. He’s already planning what he wants to do next year. Good grief, I LOVE that kid. Olivia with her bloody tooth. 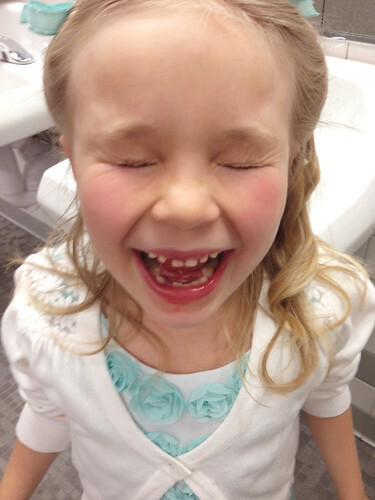 After the show was over Olivia’s tooth (that has been loose for weeks) sprung a leak and started bleeding profusely. She didn’t want to pull it until she got home and had a chance to take a good look at it in the mirror. Once we got home though, she pulled it right out. She now has the darling, and classic gap. 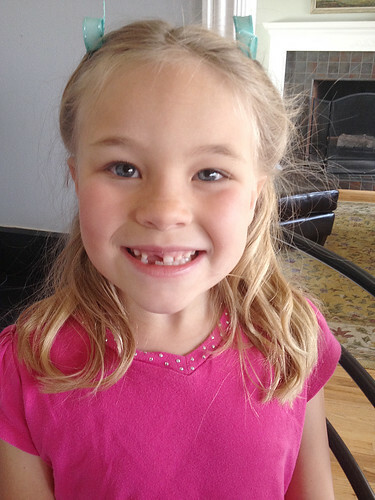 She has been going around wishing everyone “Merry Christmas” today, and then commenting how she can’t really say that because of her missing tooth. Showing off her gap-toothed smile. Be still my heart! After that excitement was over, and the small children were left in the charge of capable babysitters, Wyatt and I went out to celebrate March 28th – dinner at Taste of Punjab, and a movie. It was a nice, relaxing and fun evening. We’re looking forward to many more talent shows for years to come with our little lovelies.